This post contains affiliate links and product placements. Last weekend I took Friday spontaneously off, booked the last Air B’n’B which was available and allowed dogs and we drove down to the Alpes. 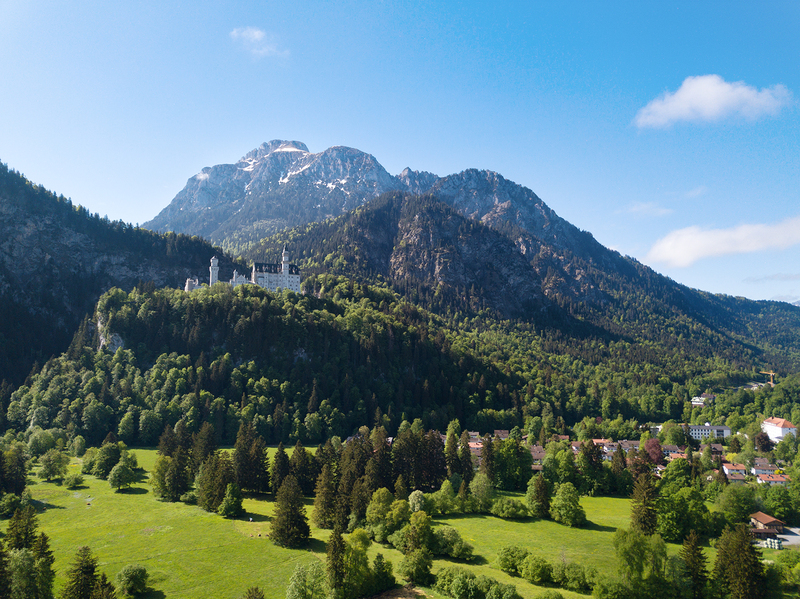 We booked an apartment in the beautiful little city of Füssen that is near the Castle of Neuschwanstein. I guess from time to time we all need a little escape from everyday’s routine. There will be a more detailed post following but here I already want to show you the first outfit we shot there. Yellow is becoming more and more of a trend color this season. The blouse is the third yellow piece in my wardrobe. Who said that yellow wasn’t a color for blondes? 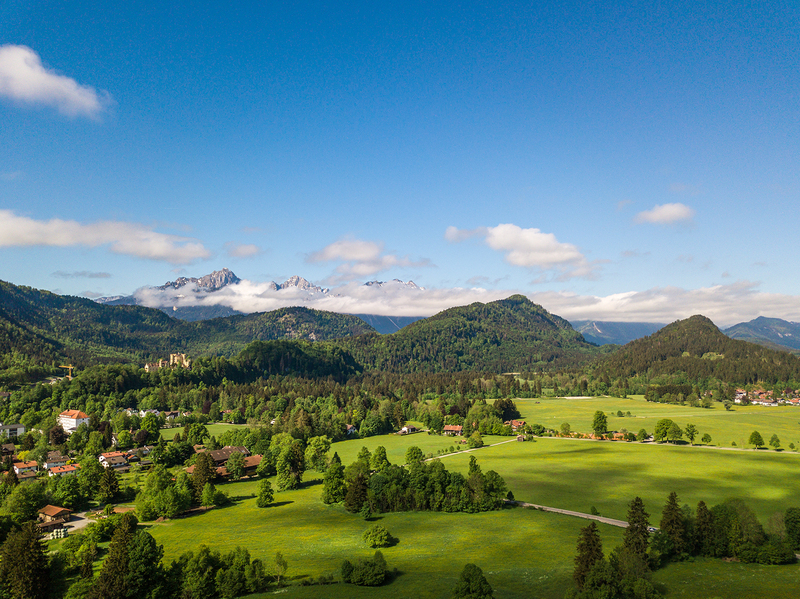 Here in the Allgäu we could finally fly our drone again – without announcing the flight beforehand to authorities in a cumbersome process, as we have to do in Ingolstadt. Of all cities ours is one with a huge no-fly zone around it. As quiet and peaceful everything seems here. Just a two-hours cardrive and you are in a completely different world. All the stress we have at the moment instantly fell off and we just enjoyed the nature around us. We also had luck with the weather. So it does not always have the be a long-distance travel to get some time off from everyday’s routine – although the next longer vacation for fall is in planning. At the moment we are thinking about Thailand. Or do you have other recommendations for November? 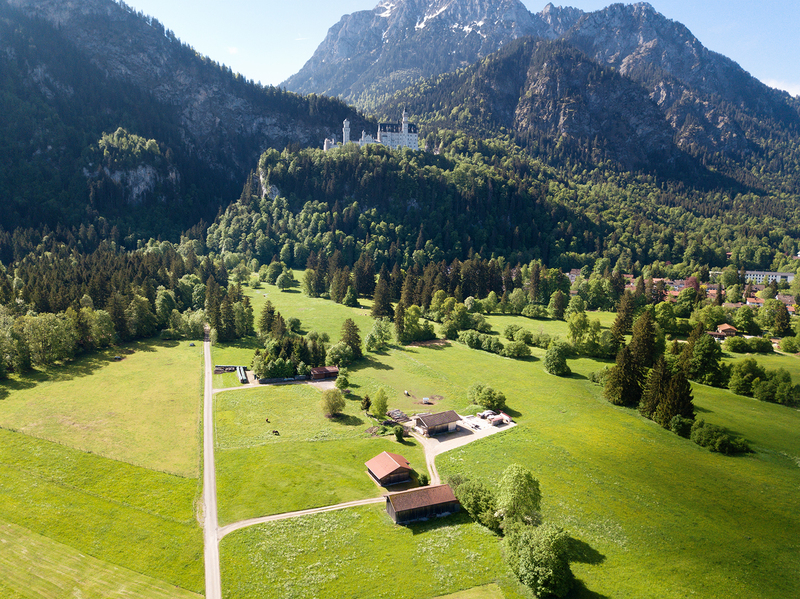 Letztes Wochenende habe ich den Brückentag am Freitag relativ spontan frei genommen, wir haben das allerletzte verfügbare Air B’n’B mit Hund in Füssen gebucht und sind ab Richtung Berge gefahren. Hin und wieder braucht man einfach einen kleinen Ausbruch aus dem Alltag! Ein ausführlicherer Bericht wird noch folgen, doch hier möchte ich euch schon einmal das erste Outfit zeigen, das wir dort fotografiert haben. Gelb mausert sich diese Saison zur absoluten Trendfarbe. Die Bluse ist jetzt schon das dritte Teil in Gelb, das sich in meinem Schrank befindet. Dabei dachte ich ewig, dass Gelb Blondinen nicht stehen würde. Pustekuchen! 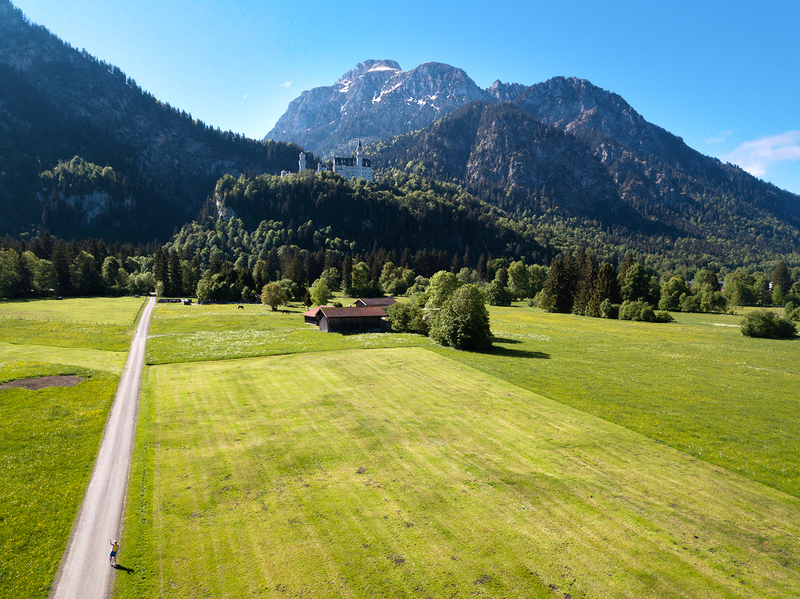 Hier im Allgäu konnten wir auch endlich wieder unsere Drohne steigen lassen – ohne unsere Flüge vorher umständlich anmelden zu müssen, wie das in Ingolstadt der Fall ist. Dort ist nämlich großräumig eine Flugverbotszone. Wir ruhig und friedlich hier alles wirkt. Nur zwei Stunden Autofahrt und man fühlt sich wie in einer komplett anderen Welt. All der Stress, den wir momentan haben, ist sofort von uns abgefallen und wir haben einfach mal die Natur genossen. Glück mit dem Wetter hatten zusätzlich. Es muss also nicht immer gleich eine Fernreise sein, um eine Alltagspause zu machen zu können – obwohl der nächste längere Urlaub im Herbst ganz bald geplant wird. Momentan steht Thailand als Reiseziel hoch im Kurs. Oder habt ihr noch andere Tipps für November? That top is so cute!!! I love the bright yellow of it. Wow fantastic pictures of such a beautiful landscape! It must be so great to fly a drone there! And your yellow/blue outfit is very nice as well! Kristina, your yellow/blue outfit is very nice as well!